The Multi Mixer (JIB/MM) is a great tool for live sound, home recording, field recording, audio/video, and many others. This unit features 4 inputs; Chan 1&2: XLR/1/4″ combo w/-20dB pad, Chan 3: Stereo RCA and Stereo 1/8″ mini (3.5mm), Chan 4: Stereo RCA. Each channel has its own volume control. 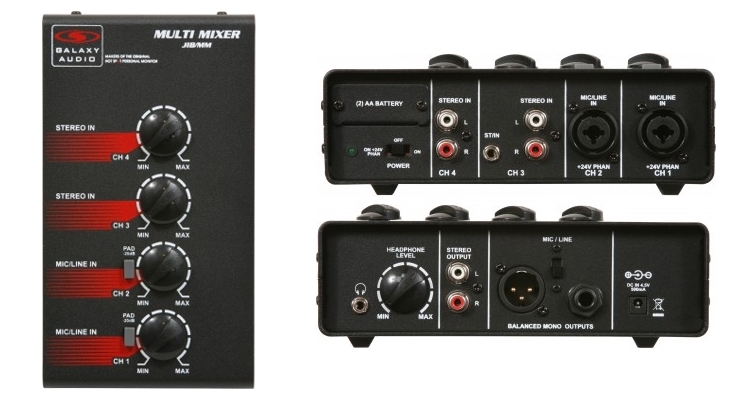 The MM also features numerous outputs; XLR, 1/4″, stereo RCA, and a stereo headphone output with a volume control. The “Mic/Line switch” located between the XLR and 1/4″ Balanced Mono Outputs allows for selecting either a “Mic Level” Balanced Mono Output or a “Line Level” Balanced Mono Output. Great for use in Field recording/ Video, Churches, Schools, and Bands.